Skinny jeans…terrifying, I know. Their name implies so many things that strike fear in the hearts of women. But, before we talk about styling our skinnies, let’s consider what they are. Skinny jeans are denim..a fabric with some structure. If you wear skinny jeans that are made of a thin fabric, you will end up showing off all of the lumps and bumps of your legs. Structure is important. Skinny jeans are not leggings. 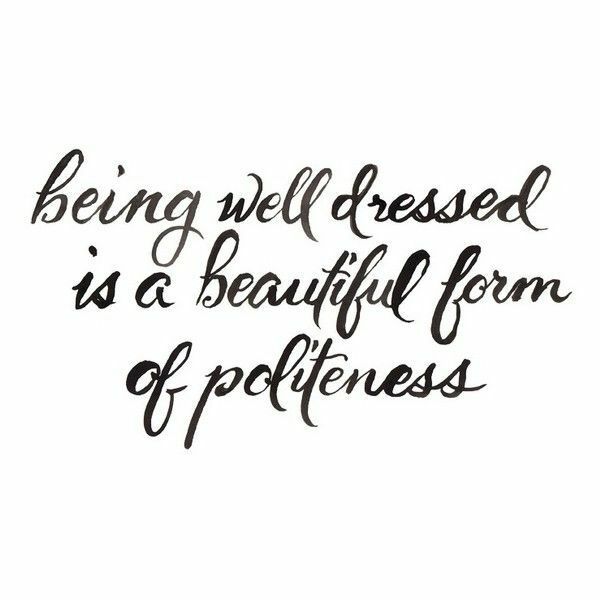 When we are in midlife, we need to consider the best way to style our clothes. This doesn’t mean we can’t participate in trends but we need to be thoughtful about how we do it. 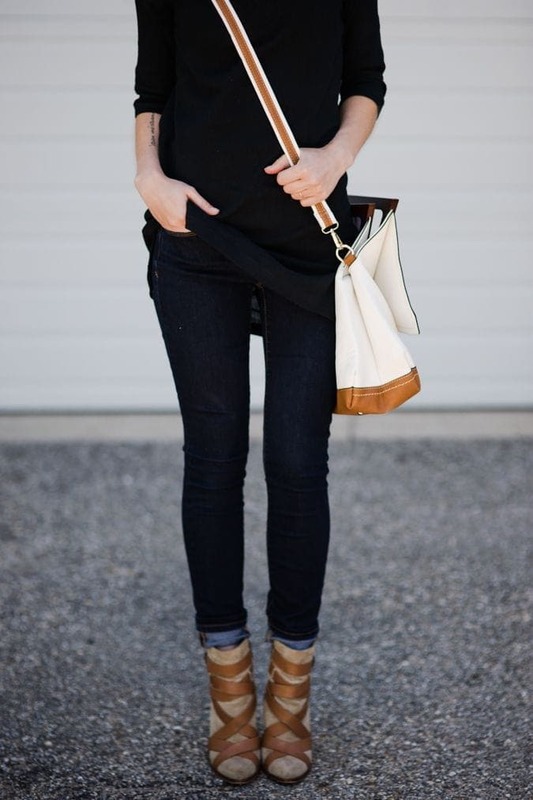 #1 – A dark wash gives a classy look and will elongate the legs. And a higher/looser waist will diminish your chances of having any muffin top. #2 – Pair them with expensive looking pieces like a silk blouse or camel coat. Notice I said expensive looking…spending lots of money isn’t necessary. TJMaxx is one of my favorite stores for flowy blouses under $25. 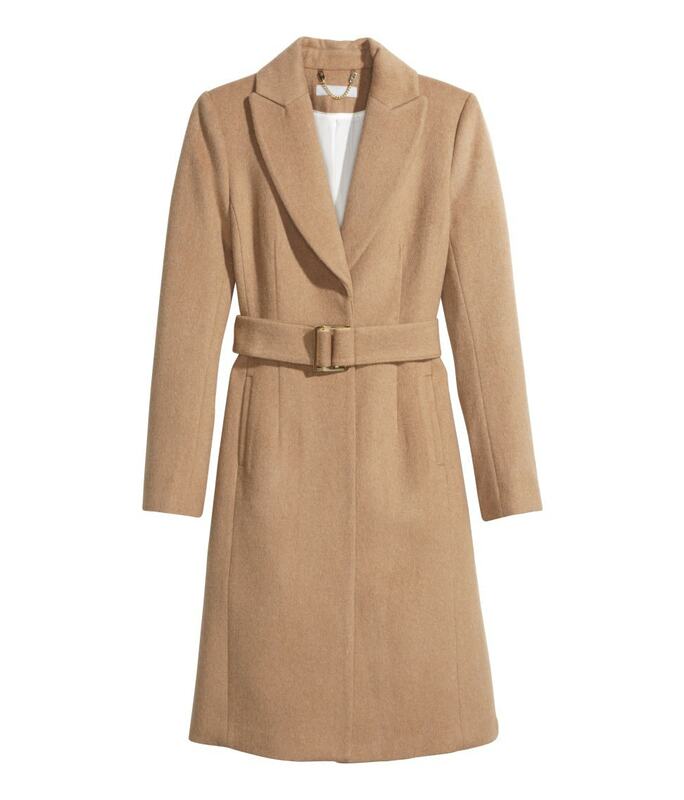 Or check your favorite discount stores for a great looking coat that won’t break the bank. #3 – Opt for shirt styles that float away from your middle. 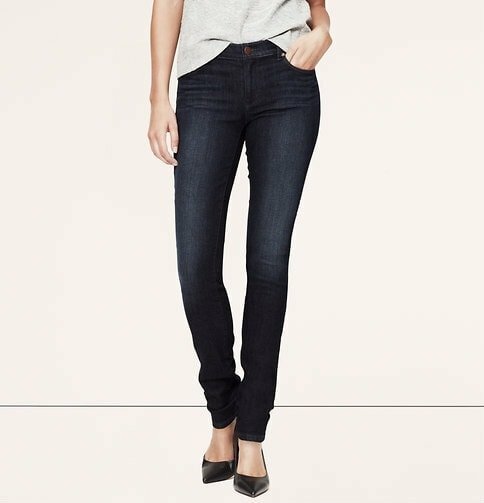 You want to balance the proportion of the skinny jeans on the bottom with more volume on the top. You can find this cute top HERE but there are only larges left. 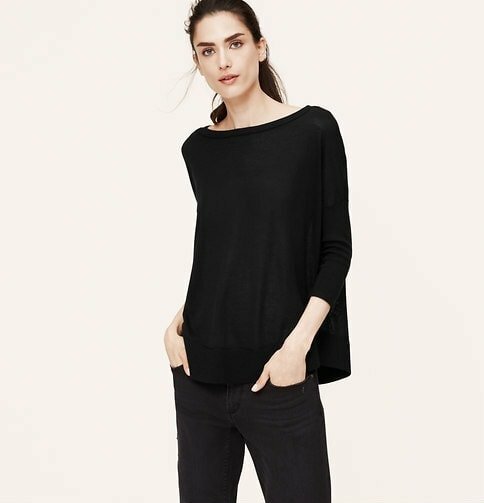 Here is a black, swingy sweater from Loft that would be a great option. Find it HERE. Did you get all of that? Look for a darker wash with a higher waist. Balance the proportion with a fuller top. If you really want the look to be slender-izing, then make it monochromatic or close to it. And lastly, make it age appropriate with expensive looking pieces such as silky blouses and a camel coat. Throw on your booties and you are GOOD TO GO! Which tip for styling your skinnies was your favorite?